Mohiniattam is one of the most lyrical classical dance forms of India, originating from Kerala. The word Mohini stands for an enchantress, a beautiful woman who seduces others for a particular purpose. Attam means dance. So Mohiniattam is the dance of the enchantress. The earliest known textual reference about Mohiniattam is found in a commentary on the Vyavaharamala, a Sanskrit text written by Mazhamangalam Namboodiri during the 16th century. In the commentary believed to be authored by a migrated Brahmin scholar of Kerala, the word for dancers was translated as Mohiniattam artistes etc. Another reference on Mohiniattam can be found in the Ottanthullal (a semi-classical and semi-folk dramatic art form of Kerala) script Ghoshayatra, authored by Kunchan Nambiar during the 2nd half of the 18th century. Perhaps Mohiniattam is the only dance form of India that was subject to several revivals and renaissance. Some scholars believe that like Bharatanatyam, Mohiniattam too was associated with devadasi tradition and other scholars think Mohiniattam was a dance form performed by women but not associated with devadasi system. Whatever it is, for several reasons the male members of the affluent and powerful Namboodiri and Nair families exploited the Mohiniattam dancers. Gradually the dance was considered inappropriate and there were few takers for it. The efforts of Maharaj Swathitirunal (1813-1846) and the attempts of Kerala poet laureate Vallathol Narayana Menon, in 1932, 1937 and in 1950, to revive Mohiniattam are important endeavors which are now considered as crucial chapters in the history of this art. The tradition of this dance form sustained through the contributions of two veterans, Guru Kalyanikutti Amma and Guru Satyabhama. While Guru Kalyanikutty Amma's was an effort at her individual level, Guru Sathyabhama got the platform of the Kerala Kalamandalam, where since 1957, until her retirement as its Principal in 1993, she was faculty. While dance forms like Bharatanatyam and Odissi attained both national and international significance until recently Mohiniattam was sidelined. There are a few reasons behind this. Kerala is a land blessed with classical arts unlike any other States of India. While Tamil Nadu is known as the land of Bharatanatyam and Orissa as the land of Odissi (Orissi), Kerala is better known as the land of Koodiyattam and Kathakali. While people and pundits of other states got either one classical form or nothing to pamper and nourish, Keralites are blessed with a few. The more stylized and classical forms got their due share. Parallel to the development of Bharatanatyam in Tamil Nadu, Kerala saw a development in sustaining Kathakali as a rich art form, followed by Koodiyattam. Hence Mohiniattam did not get much attention. Mohiniattam too was revived and preserved through the efforts of Kerala poet Vallathol Narayana Menon through the institutionalization of the art at the Kalamandalam. However, even at the Kalamandalam Kathakali enjoyed all sorts of priority, followed by Koodiyattam. None took Mohiniattam seriously to the national performing scene, during the sixties and early seventies. 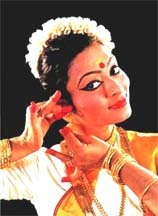 The repertoires of Mohiniattam were set similar to the Bharatanatyam. Like the Bharatanatyam, Carnatic music too was adapted for Mohiniattam. During those periods no serious research was done into the music of Kerala, the sopana sangeetam, which is most ideal for Mohiniattam. Compared to Bharatanatyam, Mohiniattam is a slow, soft and graceful dance. It is basically lasya-oriented dance form. Further, no serious research was done at the esthetical appeal of the dance form and restricted to off-white dresses, though there is historical evidence that formerly Mohiniattam dancers used colored and check blouses. Following or rather imitating the pattern of Bharatanatyam in terms of repertoire and music and being a slow dance form sans colorful dresses naturally pulled down Mohiniattam to treat it as a poor cousin of Bharatanatyam. Mohiniattam is not yet completely free from controversy about style, excessive influence of Bharatanatyam; etc. Certain self- adorned purists had contributed a lot of hindrances too to its development. Due to this several talented young dancers were compelled to refrain themselves from doing any serious work in Mohiniattam. Generally, almost all the Kerala dancers practiced three dance forms, including Mohiniattam. Their priority was Bharatanatyam, followed by Mohiniattam and Kuchipudi. Now, slowly Mohiniattam started getting its due share in both the national and international performing scene. The identity of sopana sangeetam (Kerala music) as the music of Mohiniattam is recognized. New dancers made remarkable attempts to delineate the art from following the heels of Bharatanatyam, by choreographing new items. Jayadeb's ashtapadi got an eternally alluring charm in Mohiniattam stage. Scholar-poet and theatre thespian Kavalam Narayana Panicker came forward with new compositions and researched theories to put Mohiniattam back to its rail, duly freeing it from imitating the Bharatanatyam repertoire, by emphasizing on the aesthetics and ethnic influence of the art form. Artists like Kanak Rele and Bharati Shivaji took initiative to take it to more and more platforms. While thinking on the aesthetics of an art form, one cannot afford to overlook the ethnic or regional touches of the art form. No doubt, the change in the coiffure of the dance form to give it more a Kerala touch was a remarkable contribution in this direction. The change in the hairstyle to give the Mohini a typical Kerala touch was done at the platform of the Kalamandalam under the initiation of Guru Kalamandalam Sathyabhama. Kondakettal (hair being bunched upon the left side of the head with strands of jasmine flowers circling it) was accepted as the coiffure of the art form. In any old picture of traditional Kerala women one can see this coiffure, let alone the royal women in Ravi Varma paintings. Generally, for Mohiniattam off-white dresses with golden/colored borders are used. Very limited attempts are made so far to make the costume more attractive which is one of the important aspects of any dance form to satisfy the visual needs of the rasikas (audience). Even though now a day all rasas have been used for Mohiniattam items, the basic Rasa of Mohiniattam are Sringara (eroticism) Bhakti (devotion). The basic tempo is lasya, highly feminine movements. Hence, as far as the body language of the art is concerned it is equally important to consider both what should be done and what should not be done. Now, gradually, Mohiniattam started getting its due share both at the national and international performing scene. Art lovers and connoisseurs started recognizing the performance potential and significance of Mohiniattam. Mohiniattam is getting the long deserving recognition in lead festivals of the country, especially outside Kerala. A very interesting and informative article revealing the history of Mohiniattam,Very useful for dance students indeed. Thank you very much Pallavi ji.